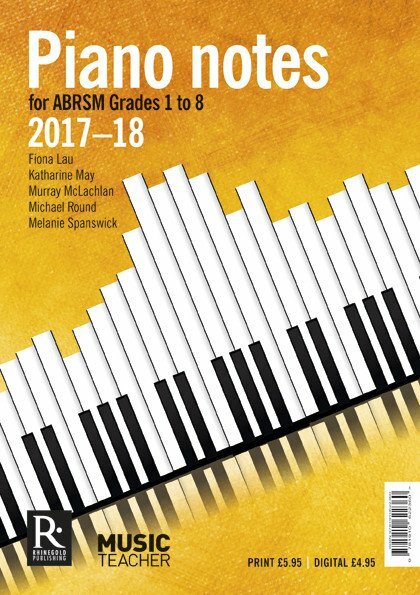 Piano Notes were published last month and offer students and teachers a wealth of practical advice for the entire ABRSM (Associated Board of the Royal Schools of Music examination board) piano syllabus from Grade 1 through to Grade 8, which started in January 2017 and goes through to Spring 2019. The notes include all alternative pieces as well as those printed in each graded book, so they make for a very beneficial and handy guide, irrespective of your standard or ability (and are great to keep by the piano as a reference). Published by Rhinegold (the leading music education publishers, who also organise the Music and Drama Education Expo Event held in February 2017 at Olympia in London), the notes can be purchased from Rhinegold’s website. Piano Notes have been written by a team of five writers, all of whom are experienced teachers; Fiona Lau, Katharine May, Michael Round, Murray McLachlan and myself, and we wrote around 200-350 words on each piece (depending on the grade), detailing the most important elements, advocating various practice tips and performance suggestions. My contribution was to write notes for all list C pieces from Grades 1 – 6. I was pleased to find a fairly widespread selection of works; from masters such as Kabalevsky, Prokofiev, Shostakovich and Bartók, through to vibrant piano arrangements, and many Contemporary composer’s works too. Although for my taste, there is probably too much emphasis on the ‘jazz’ inspired style, and not enough on Contemporary classical music (which I believe should be introduced to students from the beginning). I’ve two copies of Piano Notes to give away this weekend, so please leave your comments in the comment box at the end of this post and I will announce the two winners on Sunday evening (British time). Good luck! The publication looks very useful for teachers ! Such a wealth of information. How could one manage without it! What a great idea and so useful. Thanks for sharing it. Thanks Melanie, I’m trying to learn about ABRSM exams for my students as it’s not common where I am. This publication will be a big help! Gotta start somewhere why not with this book and a cup of coffee ? This is such an incredibly useful resource – would love to win a copy this year! I’d love a copy of this-they are so useful when teaching the exam syllabus. A valuable source of inspiration and insights into what are often unknown repertoire. What a wonderful resource for teachers and pupils to get the best out of their pieces! I’d love a copy! I’m interested in using ABRSM syllabus with my students and this would be incredibly useful! Now that something I could really use in my piano studio. My students would really benefit! An invaluable tool for both students and teachers. This will help students become more discerning in the development of their own personal music style. Well done Melanie ! I would love to win this – I am sure I would find it a very useful aid in preparing my pupils for their ABRSM piano exams. Thank you! Certainly, one of the very best, and such a friendly companion for the piano teacher, student, and lover of all good things! It will be welcomed by all aspiring, in addition to the well- launched pianist and teacher. I’ve never tried ABRSM, so this would really help out! Hi Melanie, I used to follow your blog but lost the connection when I changed my email address, so I’m enjoying getting back to your blog posts. I’d love a copy of the Abrsm notes. Pick me! Pick me! Would love to win!!! Thanks for the opportunity!! Would love to win this!! Thanks for the opportunity!! Thank you for the great opportunity to win such a wonderful prize. This would be great for my sons who are working through their grades. I hav several students working towards ABRSM exams, so this book would be very useful. Im going to take a look to the book on the web, thanks! The exam notes are fabulous, for inspiration, learning and getting familiar with new pieces and not to mention back up to show a student who might ‘challenge’ a teacher ‘look – the book suggests the same’! Love how such breadth of info across all the grades is in one single book. This is such a useful resource for teaching pieces. Looks very useful publication and it sounds like they are using a variety of fresh contributors …so would enjoy reading those, including Melanie of course! This would be incredible! Thank you for sharing! Just what I need? I’ll keep my fingers crossed. Would love to win this resource book written by experts who have studied the pieces in depth so I can focus on the important points when teaching my pupils and raise their chances of getting higher marks in exams!